The last 7 year period before the return of Jesus Christ is known as the �the Great Tribulation� period is (aka �end times� - tribulation means trouble), it will be the most difficult time ever seen on the Earth. The fifth and final earthly kingdom of Daniel's prophecy will arise and be led by the man known as the Antichrist (false messiah inhabited by Satan), and he will be assisted by the False Prophet (false witness) and they will cause people to worship a False Deity (false god) which is a statue called the "image of the beast". It will also be the time of conversion of the nation of Israel to the Gospel of Christ (Romans 11:25-29). It will be a time of great trouble which God will bring upon the whole earth - of devastating wars, persecutions, the Antichrist and natural disasters, all for the purpose of bringing God's unrepentant people to repentance, and separating the good people from the wicked and corrupt of the world. The Jewish "Feasts of the Lord" are extremely important regarding God's plan of salvation and timing. Jesus fulfilled all of the spring Feasts during his first coming and He will fulfill all of the fall Feasts on his second coming. 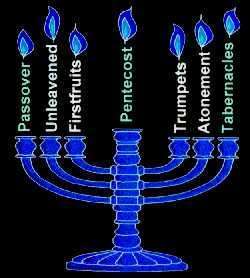 So we see the next Feast on the list to be fulfilled is the Feast of Trumpets (Rosh Hashanah). Events seem to be converging for the Great Tribulation to begin very soon, and possible pre-Trib Rapture of the Righteous (not all who call themselves 'Christian') - if there is to be one. Israel and the city of Jerusalem are truly the Lord's time clock that reveals to us where we are on the Lord's Timeline. This is the first indicator we will look at. In Genesis chapter 1, God said when creating the Sun, Moon and Stars that they were to be for 2 purposes: For Signs and for Seasons. Signs of what? Jesus, when talking about his return always mentions signs in the sun moon and stars. Specifically, he says when he returns the sun would turn black and the moon blood red. So these are the most important signs we would look for. 1967 - Israel regains Jerusalem and the Temple Mount in the 6 day "miracle war". Remember that God does nothing without first revealing it through his servants the prophets (Amos 3:7). God has been warning through his servants the prophets over the last 20 years that Jesus would return soon and that the Tribulation is coming! And very recently he has been warning that when the USA divides Israel, he will physically divide the USA. 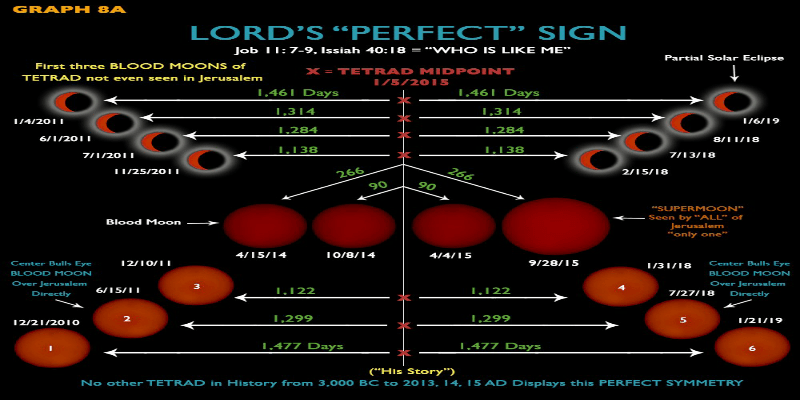 Jesus said just before his return that the Sun will be darkened and the moon to "blood red". These blood moons and solar eclipses were not those Jesus was referring to - because this will happen on a very unique day called "The Day of the Lord". It will be at the very end of the age just before Christ's visible return in the clouds. I believe these were a harbinger to the start of the Tribulation, as we will see below. Unlike the previous blood moon tetrads, this one is quite special. Take a look at the graphic below and you will immediately notice the symetry. Its a mirror image when split in the middle of the tetrad, with the same number of days between opposite blood moon eclipses. This is quite amazing considering that there is no other known similar event. The 10th and final eclipse ends the sign on 21 January 2019 - in the 70th year of the rebirth of Israel. So what will happen after that? Many people's dreams and visions indicate the tribulation will be started by some catastrophic event, like a mega earthquake or asteroid strike (see below). There has been a long "trail of signs" and fulfilled prophecies leading up to today. The Bible has been 100% accurate and so we can know for sure the rest of unfulfilled prophecy will come to pass - and it must all happen soon now because we're at the very end of the age. The greatest miracle of fulfilled prophecy in modern times is the rebirth of Israel. This was foretold several times in the Old Testament Bible, eg. Jeremiah 16. In 1947 the UN Voted to Partition 'Palestine'. This was meant to be the '2 State Solution' to give both Palestinian Arabs and the Jews their own separate states. But what did the Palestinians do? They said 'No way we will allow the Jews to have their own state next to us'. And so they rejected the offer (and every other offer since then). The next year, on 14 May 1948 the UN voted to recognize Israel as a Nation (thus fulfilling Isaiah Isaiah 66:7-8 and many other prophecies concerning God bringing back the Jews to Israel 'in the last days'). What did the Arab Muslims do? They declared war on the new State the next day. In 1967 Israel was drawn into war with a coalition of belligerent Arab/Muslim neighbors bent on destroying Israel and as many Jews as possible along with it. The war lasted only 6 days, and through a series of miracle battles gained much new territory (much of which they immediately returned by Israel), but most importantly the rest of the city of Jerusalem was taken from Jordan. After thousands of years Jerusalem was back in Jewish control! This happened on June the 6th 1967. Even though they had won back control of Jerusalem, they allowed Jordan to maintain control of the Temple Mount as a good-will gesture to the Muslims because of their Dome of the Rock temple and Al Aqsa mosque which are there. A very important cycle in the Bible is the Jubilee. According to Leviticus, every 50 years slaves and prisoners would be freed, debts would be forgiven, and the mercies of God would be particularly manifest. The 50th anniversary of the restoration of Jerusalem was June 6th 2017 and the 70th anniversary of the rebirth of Israel was on May 14 2018,. 70 is an important number in the Bible and is seen as a clue as to the start of the 7 year Tribulation. Another very important Biblical cycle is 70 years (and a also just the number 70). For example, God told the Jewish people through the prophet Jeremiah that Israel would spend 70 years in Babylonian captivity - and that's just what happened! 2017 is the 70th anniversary since the United Nations vote to partition Palestine, which led to the finalizing vote declaring the new state of Israel the next year. And its the 120th Jubilee since Adam and Eve were created !! There will never be another year like 2017. Surely we are near the end of the age. On 21 August 2017 the USA experienced its first total solar eclipse in 99 years. The last time this happenned was 1918 - the year millions died in the Flu Pandemic. It infected 500 million people across the world, including remote Pacific islands and the Arctic, and resulted in the deaths of 50 to 100 million people (three to five percent of the world's population) making it one of the deadliest natural disasters in human history. This happened during the first World War. This flu pandemic killed far more people tha died in the war, which was about 17 million - 10 million military personnel and about 7 million civilians. 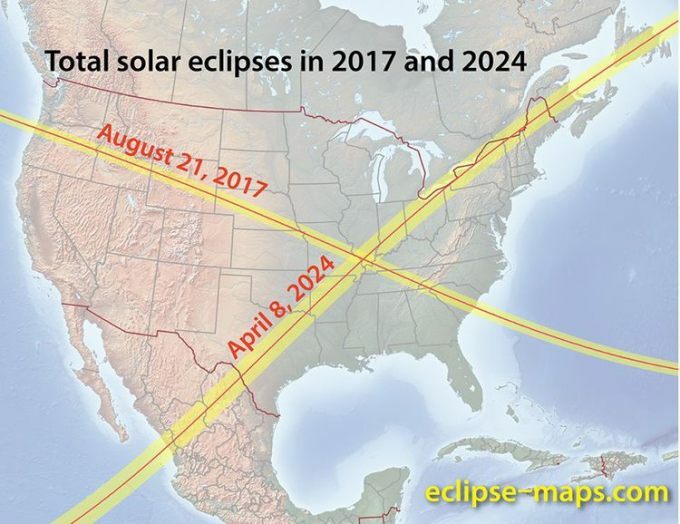 Amazingly there will be a SECOND total solar eclipse 7 years later on 8 April 2024. Incredibly, these 2 eclipses will draw an X directly above the New Madrid siezmic fault. In case you don't know, this is the epicenter of a series of three large earthquakes that occurred near New Madrid, Missouri, between December 1811 and February 1812. There were several eyewitness accounts of the Mississippi river running backwards as the land was thrust upwards! Back then there were very few people living in the area so there were probably few deaths caused by the quakes. How many would there be if it happened today? God has spoken through his prophets that he would physically split the USA in half for dividing up Israel via the United Nations. In dreams and visions people have been shown this split - from the Gulf of Mexico right up the Mississippi Valley to the Great Lakes, as shown below. Understand that the Great Tribulation is thought to be a 7 year period (Daniel's 70th Week). Do you think this is all just coincidence? The apostle John was given the visions of the Apocolypse (which is translated as 'the Revelation'). In one of the visions he was shown a sign 'in heaven' or 'in the heavens'. 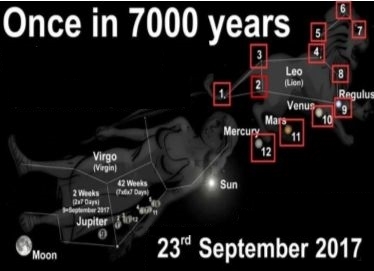 But what makes this completely amazing is that this sign happens during the "Feast of Trumpets" Sep 23, 2017. Related: Is Google and Nasa trying to hide the "Red Dragon"? We are warned in Scripture not to mess around with God's people or His land. If we do we must be ready for the consequences. For many years now, US foreign policy has been to push Israel to "trade land for peace". When Israel gave Gaza over to the Palestinian Muslims, there were no border restrictions. Was there peace? Not for long...it wasn't long before they started sending the suicide bombers into Israel so they was forced to restrict the border crossing. And now we hear of the UN and USA planning to create a Palestinian state within Israel. From the prophesies I've researched on the Web, the USA will betray Israel somehow and force this upon her. When this happens America's judgement will be swift. An Indian pastor was shown a vision of America being divided in two. He saw a huge angel swing a sword down upon America cutting it into two, saying "Just as you have divided MY land, I will divide YOUR land". 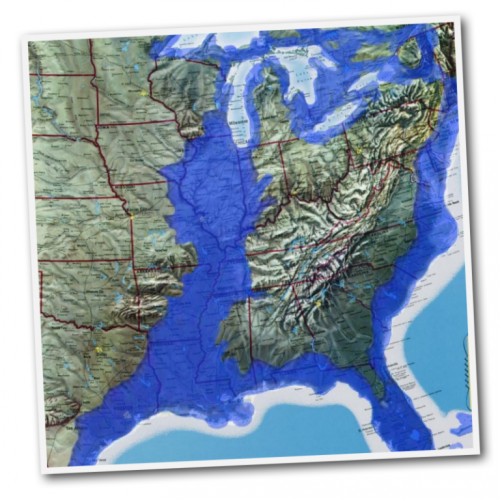 Apparently a super earthquake will strike the Mississippi Valley, causing it to sink and water fill it in all the way from the Gulf of Mexico to the Great Lakes. Now many people don't know that the Mississippi river is only a few feet above sea level, as are the Great Lakes. The Erie canal connects lake Erie to the Atlantic ocean. So it wouldn't have to sink much for this to happen. 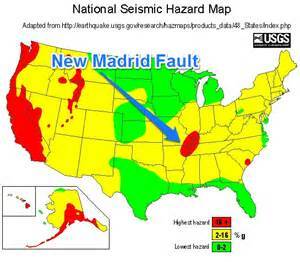 Back in the early 1800's, when the Mississippi Valley wasn't settled and there were only a few log cabins out there, a huge earthquake struck on what is known as the New Madrid fault. The ground rolled so much that witnesses say the Mississippi river flowed backwards for some minutes. Sudden Impact - could a meteor/asteroid be the trigger for the Tribulation? A Puerto Rican man named Ephraim Rodriguez has been prophesying that a giant meteor/asteroid would strike the earth since he was 16 years old. He claims the Lord has given him visions of this event in great detail. According to him it will cause a tsunami 1,000 feet high at the point of impact and a magnitude 12 earthquake. When the tsunami hits the US east coast it will be 200 feet high. It will essentially wipe out the entire east coast of the USA, and also Central and South America. This event is supposed to kill around 70 million people. And it is this event that is supposed to trigger the earthquake that splits the USA in two on the New Madrid fault near the Missippippi River. There are several other people to whom God has given dreams/revelation confirming the things Mr. Rodriguez prophesies. Click here for a Youtube search of related videos (there's plenty). Watching these videos makes me feel like I'm in some apocalyptic Hollywood movie! Remember the movie "Sudden Impact"? The premise of the movie was that an asteroid or comet was on a collision course with Earth. Certain governments of the world knew about it but kept it secret so as to avoid panic. The US President was played by Morgan Freeman - a black President. Meanwhile the US government was secretly building underground bunkers to protect government officials and a cross section of citizens, e.g. doctors, scientists, artists, etc. When it was only a few months away from impact the government finally let everyone know (but pushed by an investigative reporter who found out about it). Now after watching the above videos this scenario is eerily similar, even prophetic. The US has had a black President (some believe he may come back to power somehow); the US government has been building underground bunkers; world governments have recently created an international seed bank as if they know something we don't. Its easy to see how such an event would give spiritually aware people on earth the clear understanding that we are defintely "in the tribulation". I mean, there wouldn't be much doubt after something like that! We must understand that on God's earth there are no accidents like that. It would be a clear judgement upon the people of the earth, sent by God for his purpose. That asteroid would have been set in motion from the Creation for this specific purpose. Of course, the blind will go on being blind, saying this is just a natural event which has nothing to do with God and His judgements. Finally, about �date setting�. Please understand, I am not saying Jesus will return on any of these dates. But I do believe that they could be tied to or signal the Tribulation and the Rapture, if there's going to be one. Matthew 24:36 says that, �No one knows about that day or hour, not even the angels in heaven, nor the Son, but only the Father�. But just after that Jesus went on to say that we would know when his return is near: "Even so you also, when you see all these things, know that it is near, even at the doors." And he admonished us to watch: "What I say to you I say to everyone - watch!" He also gave us the parable of the 10 Virgins, 5 wise and 5 foolish. The wise Virgins kept their lamps trimmed and filled with oil watching for the Bridegroom. This represents Christians who are watching for their Lord to return. The foolish virgins didn't keep their lamps ready and so were shut out. This represents Christians who weren't watching for their Lord's return. I liken this to Christians today who've gotten tired of watching for Jesus' return. Because they were told that he would return in the year 2,000 (remember that?). And practically every year since then. So, like the foolish virgins they've given up watching. But now isn't the time to give up watching...now is the time to really watch! There are other scriptures as well, but this makes the point. Christ will gather his saints. But when will this happen? The disagreement comes in because some scriptures indicate that Christ will keep some Christians from the Tribulation, while others clearly indicate Christians will go through it. So some say it will be before the Tribulation starts, some say at or near the end, others say in the middle. Matthew 24:29 above makes it clear that the rapture will happen directly after the tribulation period. But there are other scriptures which indicate that at least some Christians will be kept from the tribulation. Let's take a look at two key scriptures. "But be alert at all times, praying that you may be counted worthy to escape all these things that are going to take place, and to stand before the Son of Man." Well eating, drinking and marrying sounds like normal times � even like right now, doesn't it? Conversely, if there were wars, huge natural disasters and the Anti-Christ raging against Christians, I would surely be expecting Jesus at any time. Are both positions correct? What is Jesus really saying? Could it be that there will be two second-comings of Christ? Many Christians have been led to this conclusion, and even claim to have been told this by Jesus himself (google Ray Aguilera). Two Raptures seems to be the logical conclusion. The first rapture being "the Rapture of the Worthy" or "the Thief in the Night Rapture". And the second being "the Power and Glory Rapture" and actually the visible to all Second Coming of Christ. Those who believe in the "pre-Tribulation rapture" have been taught that ALL Christians will be taken up to heaven and only the ungodly/other religions will be left. They will be left to find Christ (somehow) during the Tribulation years (many teach that the Holy Spirit of God will be removed from the Earth during this time, but if that is true then how could anyone come to Christ? - its simply not possible because no person can come to Christ without the Holy Spirit's drawing and conviction). Ray Aguilera's message seems like the true and correct scenario: that only about 1% those who consider themselves Christians will be taken in this rapture - those who are truly walking with Jesus. Everyone else will have to go through the refining fire. All of the lukewarm and cold Christians will have to wake up and "smell the coffee" as it were. It will be these Christians who have all of the years of teaching and knowledge who will help bring in the great harvest of souls. So DO NOT DESPAIR if you are left behind - it is for a purpose and GOD NEEDS YOU to fulfill your mission. A careful study of what God says in Revelation (chapters 2 and 3) to the seven early churches gives us some major clues as to how God views all populations of Christians. Notice that only the Philadelphia Church (and a number of believers at the churches in Sardis and Smyrna) is without fault and has no need to "repent". They are the only church guaranteed to be spared the �hour of trial� (Revelation 3:10). 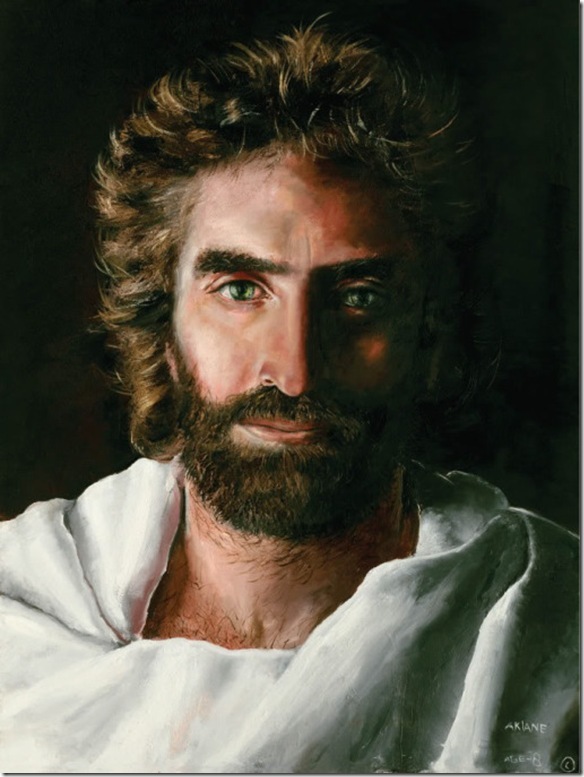 Maybe these are the �worthy� ones Jesus referred to in Luke 21:36. The remaining churches (which would mean the majority of Christians) have the need to be tested and overcome in order to be considered worthy. If they do not repent and embrace full love and faith in God (as warned specifically in these letters) they MUST go through the Tribulation, a time of severe testing and persecution, "such has never been seen before or will ever be seen again". If you believe that Chapters 2 and 3 of Revelation only apply to the churches two thousand years ago, please note that each letter ends with: "Anyone who has an ear should listen to what the Spirit says to the churches." Revelation 3:3 - "Remember therefore what you have received and heard; keep it, and repent. But if you are not alert, I will come like a thief, and you have no idea at what hour I will come against you." Enoch was Noah's great grandfather. Not much is said of him, other than "he walked with God" and was translated (or raptured) up to heaven. He must have been very close to God, and very beloved of Him. I would venture to say that there are only a small percentage of Christians who are walking with God as Enoch did. 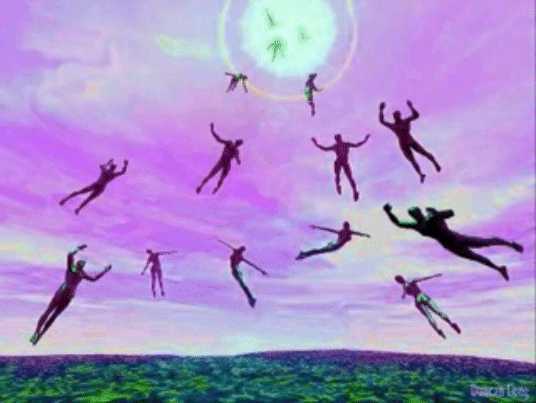 With Enoch, God has given us a picture of the future Rapture of the Worthy. And who is to be raptured? Those who have been "walking with God". What happens to people who don't escape and are stuck on Earth for the Tribulation period? Who wake up one morning and discover that millions of people are missing? Imagine all of the "missing persons" calls to the local police departments. And for Christians left behind, most will be totally bewildered as to why they would be left behind. There will be no denying that the "great disappearance" has happened, as everyone will know someone who was taken. So what will be the explanation? Have you ever wondered about all of the UFO sightings? Most Christians know that it is Satan who is behind these to deceive the people of the World. But these satanic apparitions have not been done without a purpose. This has been a carefully executed plan. But what plan? To explain the Rapture! "They were abducted by aliens" will be the excuse the media latches onto. It is my opinion that most people will readily believe alien abduction over a "God abduction". Have you noticed all of the alien movies - from E.T. to Independence Day, they all seem to be conditioning us for something. Make no mistake about it, these movies aren't just for our entertainment. Its possible we're being conditioned to accept UFO contact for a big purpose - to provide a lie to explain the Rapture of millions of people from the Earth. But most Christians would quickly understand what has happened. They will know that they are now "in the Tribulation" and must go through it. These are all unbelievers and tepid (luke-warm) and worldly Christians (let's face it - the majority) who must then repent and turn whole-heartedly to the Lord and profess full love and faith in Christ during the time of Tribulation. This group must cope with the rule of the infamous Antichrist and refuse to worship him or his image, and above all to refuse 'the Mark' that enables people to buy and sell under the Antichrist's temporary new world order. Many of these Christians are reported by the Bible to be executed (beheaded) for refusing the Mark of the Antichrist � these Christians choose execution, because the alternative is eternal torment in Hell, which is the punishment promised by God to anyone who takes the Mark (so if you are left behind, whatever happens do not take the Mark). On top of that, "natural" disasters will be occurring all across the world, with great frequency and with terrifying effect. Earthquakes, hurricanes, volcanos, tsunamis, heat waves, famine, plagues � in many places these disasters will be so widespread that the Antichrist may be the least of peoples' concerns. The things that are going to take place are the disastrous and terrifying events of the Tribulation, which as stated above, the Philadelphia Church in Revelation 3:10 is told it will be spared from. If you're paying attention, Luke 21:36 and Revelation 3:10 appear to state the same thing � that at least some believers will be counted worthy to escape 'these things that are going to take place' (Luke 21:36) and be spared from the 'hour of trial' (Revelation 3:10). These are the Christians who have been fully walking with God and have born much fruit in their lives. What if I'm Left Behind? If you should find yourself left behind � do not despair. It may be that you are left behind because God needs you here. Or it may be that you are not yet ready to go to heaven because you don't have any real fruit yet. You're intentions may be good, but you actions haven't been right. Maybe you've been living for yourself and haven't done much at all for others. I think there will be a great many of these. Others who are "Christian" may be in sin or just tepid, or like the 5 virgins who didn't keep enough oil. Others may indeed be watching for Him but know in their spirits that they aren't ready to be taken. Maybe because even though they may be regular church-goers and pray and tithe and actually have a relationship with the Lord, they may have had some sins in their past which have messed up their Christian life such that they were unfruitful for the Lord. I think anyone who has been a Christian very long has seen how the Enemy has been going about devastating families, doing anything and everything to keep people from bearing any fruit. Therefore if they were raptured, they would go to heaven with little or no fruit. I personally believe that God's desire is for all of us to have much fruit. Imagine a crown with no jewels on it? So the tribulation provides a time to be used by the Lord - he needs these people to help gather in the great harvest of souls. God also promises to pour out His Spirit in the last days. Imagine all of the non-Christian, but good people all around you who will be in a panic when the Tribulation is under way. They will respond to God's Spirit and there will be great revivals around the World. This is the time to work for God in earnest, to help bring in the great harvest. 4 I saw thrones on which were seated those who had been given authority to judge. And I saw the souls of those who had been beheaded because of their testimony for Jesus and because of the word of God. They had not worshipped the beast or his image and had not received his mark on their foreheads or their hands. They came to life and reigned with Christ a thousand years. 5 (The rest of the dead did not come to life until the thousand years were ended.) This is the first resurrection. 6 Blessed and holy are those who have part in the first resurrection. The second death has no power over them, but they will be priests of God and of Christ and will reign with him for a thousand years. The Antichrist and the Mark of the Beast - DON'T TAKE THE MARK !!! Revelation also tells us that a man will arise during the Great Tribulation who will be Satan incarnate. He is called the Beast and the Antichrist, because he's totally against Christ. The Bible says that the Antichrist spirit has been working in the world until even now. This man will be the embodiement of this Satanic spirit. And he will cause everyone, great and small, to wear a mark on their right hand or forehead. This mark will be required to buy or sell anything - without it you cannot participate in commerce. We don't know what this mark will be...it could be a barcode or even a chip embedded under your skin. Seeing as how all countries have standardized on barcodes at checkout counters, I tend to think its a barcode (somehow). Anyway, the point is, whatever mark the government says you must put on your right hand or forehead - DON'T TAKE IT! Because the Bible says that if you do, you will HAVE NO CHANCE OF SALVATION afterwards. NONE. I cannot emphasize this enough - DON'T TAKE THE MARK. Don't worry about how you will feed yourself or your children - God will take care of that. Even if you starve to death, its better than going to Hell. The Antichrist will persecute Christians relentlessly, and will kill us by beheading. We see on the news that ISIS/ISIL is beheading Christians now. For this reason I believe the Antichrist will be a muslim leader, possibly the leader of ISIS/ISIL. We'll know who he is soon enough. He will have a VERY PERSUASIVE speach, very much like Hitler was reported to have had. So much so that even Holy Spirit-filled Christians can be drawn in - but look away! Don't be fooled and taken in. Stay close to God and pray for spiritual protection. Revelation 6 tells us about the Four Horsemen of the Apocalypse�. The first horseman is a Conqueror and the second horseman is WAR. So war seems to mark the beginning of the Tribulation. Some Christians are saying that a Middle East war could trigger a conflict between Israel and Iran (nuclear production facilities? ), and that it will quickly spread to the rest of the world. Others say a financial collapse will trigger panic and lead to chaos and wars. If America is split in two as has been prophesied, there will be nothing to stop North Korea from invading South Korea, or China from invading other countries, like Australia. And little to stop Putin from doing as he pleases with the Russian military he controls. in quietness and trust is your strength"). Read and memorize the Bible to get the Word of God in your heart. And PRAY! Of note, years ending in 7 have been significant in the re-establishment of Israel. Some Christians have been postulating the return of Jesus on or shortly after 2018 based on the reestablishment of Israel in 1947/1948 and 70 years being a very signficant number in the Bible (e.g. the span of a man's life (Psalm 90:10)) and the generation that sees the restoration of Israel would see Jesus' return, and also the retaking of Jerusalem in 1967 and the 50 year Jubilee cycle. Speculation aside, a great many saints are reporting being told by the Lord that he is coming very, very soon. 1897: First Zionist held in Basel, Switzerland (Jewish flag created). 1917: General Allenby conquers Jerusalem from Turks ending 400 years Islamic rule over Israel. Balfour Declaration � British policy statement toward creating a homeland for the Jewish people. 1947 (Nov 29): United Nations votes to partition Palestine which led to the official State of Israel being declared the next year. 1967: 6 Day War restored Jerusalem to Jewish control - Jubilee year? Jesus said to WATCH and PRAY. Lord Jesus, may we all do so with all diligence. May God bless you as you look for HIS RETURN.